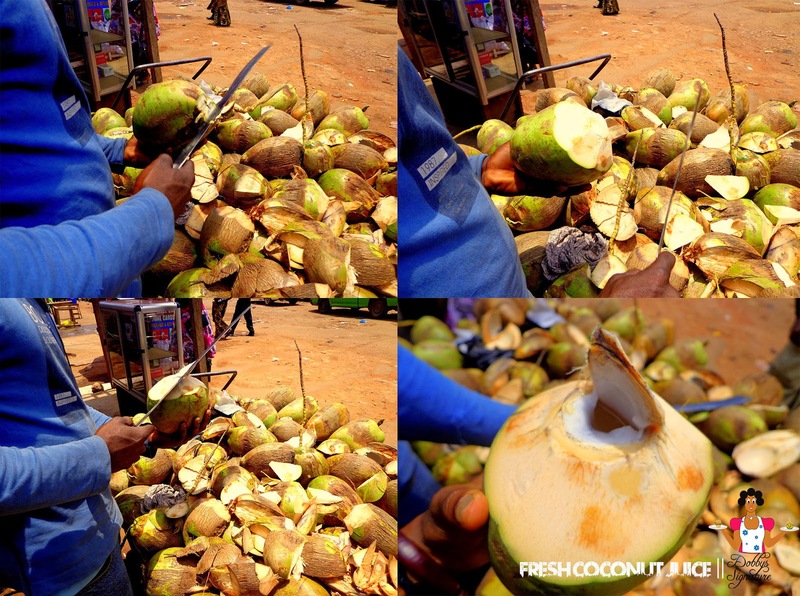 Fresh coconut is really popular in Ghana. I could count at least 3 fresh coconut vendors in the vicinity I stayed in. They sold the coconuts in Trolleys and once in a while people would stop by the trolley to buy 1 or 2 coconuts. All the coconut vendor had to do was to slice off the top part of the coconut with a machete to make a hole where you could drink the water easily. No added sweeteners, preservatives or flavorings, just purely natural. This is what I call drinking healthy away from home. The unique thing about it is, it’s usually packed to the brim with coconut juice/water and the coconut flesh is so soft, you could actually swallow it in one gulp. Coconut water and juice basically refers to the same thing which is the semi clear liquid found in young coconuts. The juice of the coconut is fat free and low in calories (1 cup contains 50 calories) unlike coconut milk which is high in saturated fats (1 cup contains 550 calories). It’s usually sold for 1cedi. The bottom line is, coconut juice is totally awesome!!! • Coconut water is rich in minerals such as Potassium and magnesium, amino acids, dietary fiber, Vitamin C but low in sodium which makes it the ideal Natural energy drink. • Coconut water is a natural diuretic which helps in kidney cleansing. This means that once you take the juice, you’d get to urinate pretty often and in turn rid your system of unwanted materials. Thank you for this post. i love coconuts too & i have also noticed the diuretic effects you talked about. Great site dobby. I tried this when I was in Accra a few years ago. It was nice. Very refreshing on a hot summer day.